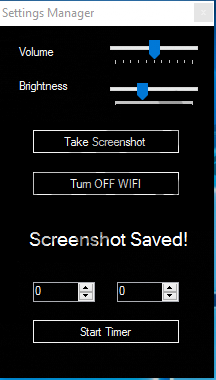 Avboost creators describe this tool as a Desktop manager that can allow the user to adjust screen brightness, volume, take screenshots or turn the WIFI on and off instantly. However, our researchers tested the application and noticed it might do more than the listed functions. It appears to be the program could place adware components on the computer. Thus, after the installation, the user may receive a lot of annoying advertising content that could be displayed periodically by launching the user’s browser or opening new tabs without any permission. Such behavior was the main reason why Avboost got classified as a potentially unwanted program (PUP). If your wish is to know more details about this doubtful software we encourage you to keep reading our article. Also, provided you do not want to see any suspicious advertisements or keep an unreliable application on the system we advise you to get rid of the software faster; either with a trustworthy removal tool or the instructions located below the text. The PUP is supposed to be available on avboost.club, the Desktop manager’s official web page, but the provided Download button does not work. Nonetheless, this does not surprise us as the potentially unwanted program was noticed to be distributed with bundled software installers, for example, one of it researchers located on a website called lapapahoster.com. At this point, it is important to mention that the setup files Avboost could be bundled with may not necessarily mention the application or any other components would be added too. In order to avoid such mistakes in the future, we would simply recommend reading terms on the configuration wizard more carefully. If the provided information suggests anything about adding tools without notifying the user, you should cancel the installation process at once. Plus, you should not forget that in some cases such conditions can be seen only if you choose advanced or custom installation settings, so you should pick them always when such an option is offered. As for additional protection, users could keep a legitimate antimalware tool installed since it can protect the system from various threats. Once installed, Avboost should create a couple of folders in the %PROGRAMFILES(x86)%, %PROGRAMFILES% directories and a couple of Registry entries in the HKEY_LOCAL_MACHINE\SOFTWARE\WOW6432Node\Microsoft\Windows\CurrentVersion\Uninstall, HKEY_CURRENT_USER\SOFTWARE\Microsoft\Windows\CurrentVersion\Run locations. One of the Registry entries (located in the Run key) is created to allow the PUP launch itself automatically with the operating system. The other one (created in Uninstall key) is so that the user could remove the software automatically through the Control Panel. The only problem is, the application was noticed to place adware components on the computer and uninstalling Avboost does not erase them. The mentioned adware components are executable files with random titles, for example, mjtgitgcuj5.exe, mjtgitgcuj5.exe.config, and so on. These files should be placed in randomly titled folders (e.g. reuiddxwtbf) located in the %PROGRAMFILES% and %APPDATA% directories. Our researchers say this data could be responsible for suspicious third-party advertisements that might be opened with the user’s default browser. If the user is already browsing the ads could be opened in new tabs or displayed as pop-ups, and if the browser is not being used, the adware components may open it without asking any permission. If you encounter this third-party content, we would advise you to be extra cautious as it could promote fake lottery winnings, offer to participate in suspicious surveys, suggest you install more adware or potentially unwanted programs, redirect you to malicious websites, etc. In conclusion, even though Avboost provides a few tools for Desktop management in one window; it may place adware components on your computer too, and such data could display irritating third-party ads without your permission. It seems to us it is not worth to endure such behavior since your operating system should provide the same or even better tools than the PUP can give. If you think the software is rather useless as well, we urge you not to waste any time with it and eliminate it at once. The instructions below this text will show users how to delete both data belonging to the Desktop manager and files recognized as adware components. In case this process appears to be too complicated for you, we would recommend installing a reliable antimalware tool instead. It could detect and erase not just this suspicious application or data associated with it, but also other possible threats, so it is a rather easy way to clean up the system. Look for directories titled as AVBoost, right-click them and select Delete. Search for randomly titled folders, e.g. reuiddxwtbf; they should contain suspicious executable files with random titles as well (mjtgitgcuj5.exe, mjtgitgcuj5.exe.config, etc.). Right-click the folders containing adware components and select Delete to erase them. Press Win+R, type Regedit and click Enter. Find a value name called AVBoost, right-click it and press Delete. Look for a key named as VBoost_is1, right-click it and select Delete. Quick & tested solution for Avboost removal.